Electrical solutions for mining Line card Robust performance above and below ground Drill & blast Crush & grind Material handling Energizing a world that demands more. Eaton and Cooper are united for mining. Our products are energizing the world to maximize uptime and improve cost and energy efficiency while keeping people and property safe. We’re energized by the challenge of powering a world that demands more. With more than 100 years of experience in electrical power management, we have the expertise to see beyond today. 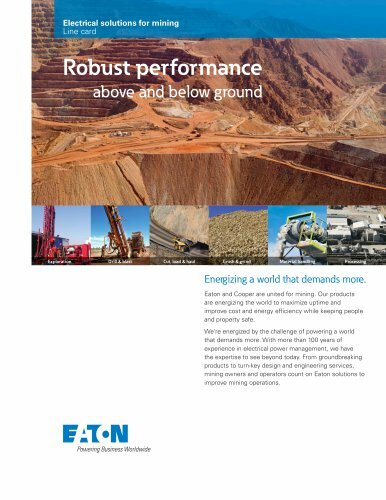 From groundbreaking products to turn-key design and engineering services, mining owners and operators count on Eaton solutions to improve mining operations.